Advocating for the elimination of death & injury on Canada’s roads. Qu’est-ce que la Vision Zéro ? What follows is the full text of legislation adopted by The European Parliament in 1998. 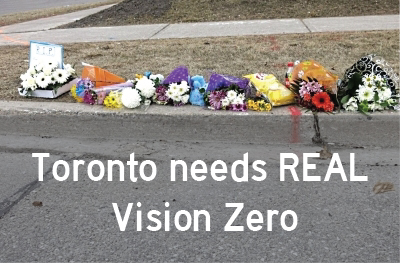 It’s time for Canada to embrace similar policies—perhaps in the form of a Canadian Charter of Safe Mobility ensuring the health, dignity and freedom of all road users including vulnerable ‘walkers and wheelers’ (e.g. pedestrians, cyclists, wheelchair users). Those rights are already implicit in Section 7 of Canada’s Charter of Rights and Freedoms. 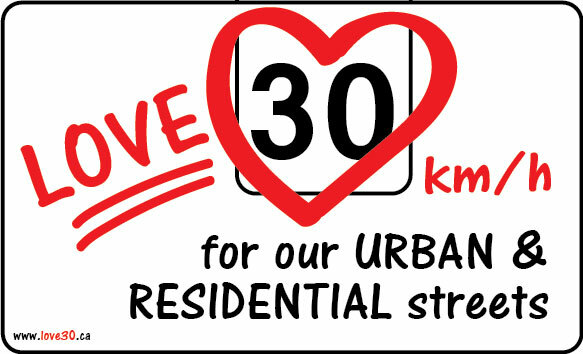 Yet how many of our neighbourhoods have unsafe speed limits, inadequate space for cycling and walking, or poor winter maintenance that makes safe active transit impossible? Even in Europe many member states have failed to enshrine this charter with legislation putting these rights into practice. But many European countries are far ahead of Canada when it comes to traffic violence and active transit, so there’s no excuse for Canada not to act. I. The pedestrian has the right to live in a healthy environment and freely to enjoy the amenities offered by public areas under conditions that adequately safeguard his physical and psychological well-being. II. The pedestrian has the right to live in urban or village centres tailored to the needs of human beings and not to the needs of the motor car and to have amenities within walking or cycling distance. III. Children, the elderly and the disabled have the right to expect towns to be places of easy social contact and not places that aggravate their inherent weakness. IV. The disabled have the right to specify measures to maximise mobility, such as the elimination of architectural obstacles and the adequate equipping of public means of transport. V. The pedestrian has the right to urban areas which are intended exclusively for his use, are as extensive as possible and are not mere ‘pedestrian precincts’ but in harmony with the overall organisation of the town. (h) the introduction of the system of risk liability so that the person creating the risk bears the financial consequences thereof (as has been the case in France, for example, since 1985). (c) the creation of parking lots which affect neither the mobility of pedestrians nor their ability to enjoy areas of architectural distinction. VIII. Each Member State must ensure that comprehensive information on the rights of pedestrians is disseminated through the most appropriate channels and is made available to children from the beginning of their school career. PLEASE SHARE this page ... ESPECIALLY ON FACEBOOK if you have it, as that helps a GREAT DEAL.